The story of the four cylinder motorcycle in America lasted a short 33 years . From the invention of Percy Pierce in Buffalo New York in 1909 through the glory days of the Indian who ceased production in 1942. The Pierce motorcycle was produced in very limited numbers for an elite class of 2 wheel enthusiasts lasted only a few years. The Pierce was also the first American motorcycle that perfected the shaft drive system. Although the Pierce had no remarkable achievements it did pave the way for the most successful of all American four cylinder machines. With the demise of the Pierce in 1912, the Henderson brothers in Detroit Michigan were well on their way to produce a machine that became the benchmark of this design. Lasting from 1912 through 1934 the Henderson design was integrated in both the early Indian 4 and its forerunner the ACE built in Philadelphia, PA. The success of the Henderson ran the gamut. Carl Stevens Clancy rode his 1912 Henderson around the world in that year. Will Hendersons invention of the 3 speed transmission coupled with the Henderson four allowed Alan Bedell to set the transcontinental record in 1917. This record was reset by the famous Cannonball Baker in 1922 on a Henderson which in 1918 became a product of the infamous Schwinn/Excelsior dynasty in Chicago. Ignaz Schwinn and his team of engineers reinvented the Henderson 3 times until the demise of that company in 1931. 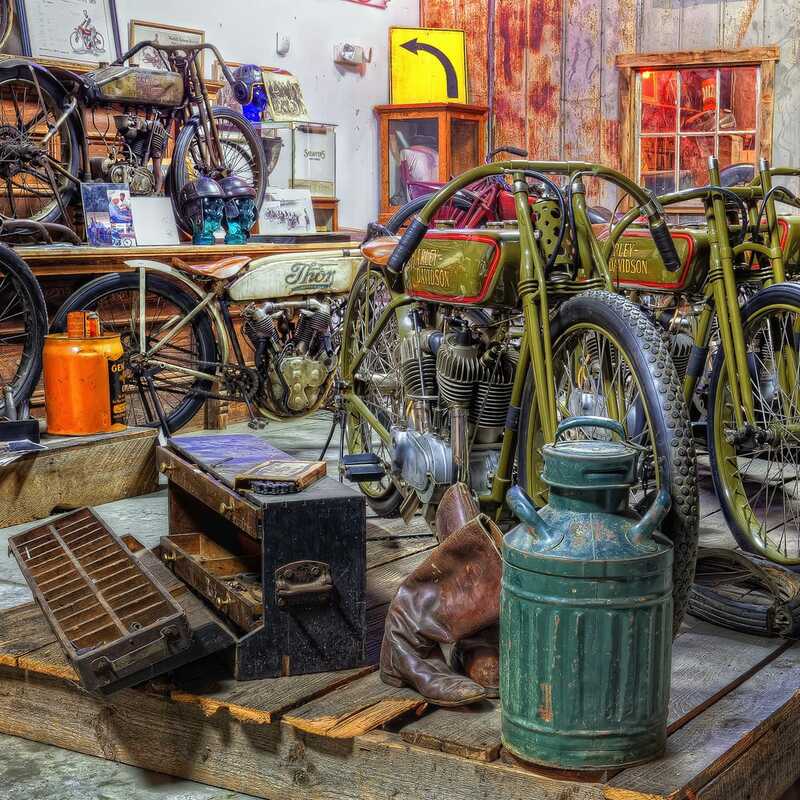 Looking back to 1920 the Henderson brother reinvented their original four design now called the ACE in Philadelphia, lasting until 1927 when their company was picked up by the well healed Indian company produced in Springfield Massachusetts. Indian redesigned the four several times until they ceased all four production in mid 1942, with the advent off the great war. The Wheels Through Time collection of four cylinder machines is quite extraordinary, containing several prototype models, specials, and production models spanning nearly the entire history of this American Phenomenon. 1913 Long tank Henderson features single speed transmission and the beautiful Henderson lines. Second year production for the Henderson Motorcycle. Formerly owned by Steve McQueen. Second year production for the Pierce Motorcycle. Features direct drive, no transmission. Also, Pierce pioneered the shaft driven machine. Last year production for the four cylinder Henderson. Built in Chicago by Ignaz Schwinn. Known as the Upside Four due to its unusual cylinder head and carburetor combination. This upside down engine was produced for two years only.